Ruth, the married woman he carried on with for years . . .
the ultra-hapless Rub Squeers, who worries that he and Sully aren't still best friends . . .
Sully's son and grandson, for whom he was mostly an absentee figure (and now a regretful one). We also enjoy the company of Doug Raymer, the chief of police who's obsessing primarily over the identity of the man his wife might've been about to run off with, before dying in a freak accident . . . Bath's mayor, the former academic Gus Moynihan, whose wife problems are, if anything, even more pressing . . . and then there's Carl Roebuck, whose lifelong run of failing upward might now come to ruin. And finally, there's Charice Bond--a light at the end of the tunnel that is Chief Raymer's office--as well as her brother, Jerome, who might well be the train barreling into the station. 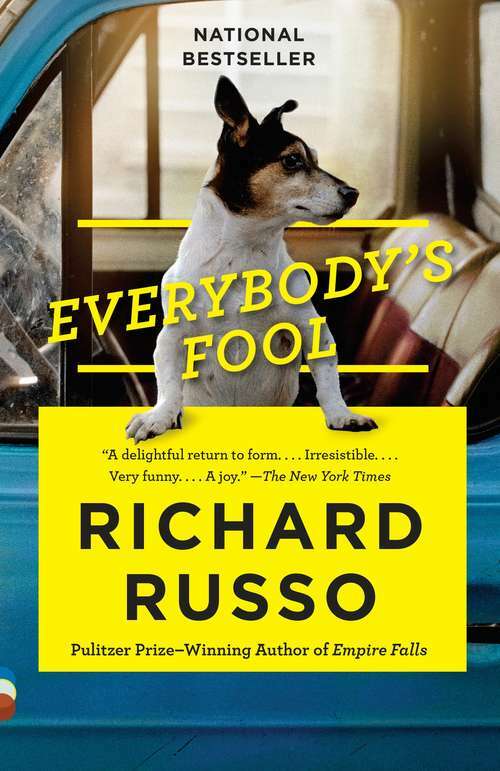 Everybody's Fool is filled with humor, heart, hard times and people you can't help but love, possibly because their various faults make them so stridently human. This is classic Russo--and a crowning achievement from one of the greatest storytellers of our time.